The job avenues for a pharmacist are with pharmaceutical industry, government departments, universities, hospitals, investigation and research institutes etc. Within the pharmaceutical industry you might be involved in activities relating to the development, formulation, production or marketing of new drugs for clinical use. Drug control administration and armed forces also offer a wide range of opportunities to pharmacists. Appointments are also available in sale promotion work as medical representatives. As a Medical Representative he keeps the medical practitioner informed about the new drugs and treatments developed by various pharmaceutical companies and thus indirectly promote their sales. There is also an employment opportunity within the food and cosmetic industries or within any other industry that requires the assurance that new products are as safe and effective as possible. In government departments, a pharmacist maintains proper records according to various Government acts governing the profession of pharmacy. As a drug inspector or government analyst he has to make sure that the drugs manufactured and sold, are of standard quality. 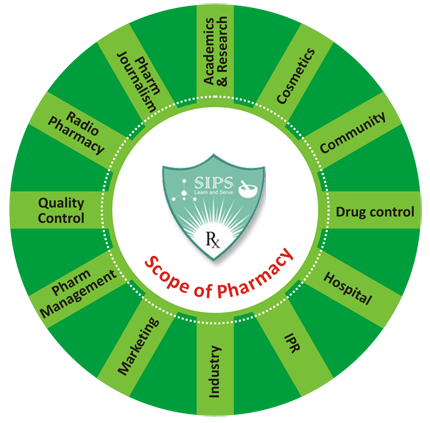 A diploma or degree holder in Pharmacy, after registering with the State Pharmacy Council, can set up and run their own pharmacy or chemists and druggists shop to stock and sell medicines and dispense them according to doctor’s prescriptions. In a retail Pharmacy he has varied duties, including buying and selling of related items demanded by the public. Opportunities for M.Pharm and Ph.D holders are: Teaching profession in institutes and universities; Research work to develop new drugs in laboratories and Research & Development centers; Production and Analytical work in Pharmaceutical Industries.